Menocet is a herbal supplement that helps deal with hot flashes, night sweats, irritability, mood swings and other common symptoms of menopause. Vitamin B1, B2, B6, B12, Niacin, Folic acid – Required for proper functioning of the body, especially the circulatory system. Calcium – Strengthens and fortifies bones and prevents osteoporosis. Phosphorus – Aids in the absorption of calcium and is essential for healthy bones and teeth. Magnesium oxide – Essential for bone health and also reduce other symptoms of menopause like insomnia, mood swings, irritability and water-retention. Magnesium also increases energy and makes you more active. Black Cohosh root powder – Contains estrogen-like phytochemicals that are used as alternatives to hormone therapy. Relieves hot flashes and other symptoms of menopause. Red clover blossoms powder – Commonly used ingredient in supplements to support women health. It contains isoflavones which act like estrogen and reduce menopause symptoms. Dandelion root powder – Reduces hot flashes and night sweats, acts as a kidney and liver tonic and helps detoxify blood. Saw Palmetto powder – Helps control symptoms of menopause and also prevent atrophy of vaginal and uterine tissues. Soy isoflavones – Mimic the properties of estrogen and tone down menopause symptoms. One capsule should be taken every day to control the signs and symptoms of menopause. Black cohosh may cause digestive problems and upsets and in rare cases, may affect liver function. Some people are allergic to soy and should not opt for this product. A pack of 30 capsules costs $19.95 and if you opt for the auto-refill option, an additional 20% discount is offered bringing the effective cost down to $15.95. While the company does not offer a money refund, it allows customers to exchange the product with any other product available in their range if they are not happy or satisfied with it. This replacement guarantee is valid for 30 days from the date of purchase. 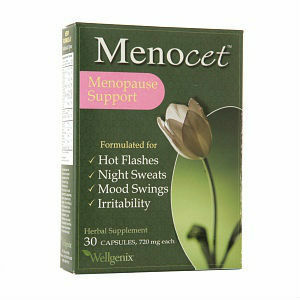 Menocet contains natural ingredients that are commonly used in menopause supplements. Even the commonly used menopause supplements like MenoClear have some of these ingredients. Menocet does not have different day and night formulae to cater to the body’s different requirements at different times. It also does not have a money-back guarantee, but the company does back the product by offering a replacement policy. Jackie Horowitz	reviewed Menocet	on July 24th	 and gave it a rating of 2.